It’s a shocking statistic that one in four women and one in seven men are physically abused by their intimate partner, according to the National Intimate Partner and Sexual Violence Survey conducted by the Centers for Disease Control and Prevention. Knowing the warning signs of a dangerous and obsessive relationship can be life-saving for you or your loved ones. Most abusers begin displaying subtle signs before they engage in behaviors that can be destructive and harmful. It's great when your partner takes an interest in your life, but it can take a dangerous turn when he needs to know absolutely everything. Stalking is a form of dating violence in which the victim is under constant surveillance. Some common tactics used by stalkers include following the other person, checking their phone calls, showing up at their workplace and even invading their property. Other warning signs include hacking into your social networking sites, into your email or having "informants" that can keep him posted as to your whereabouts. 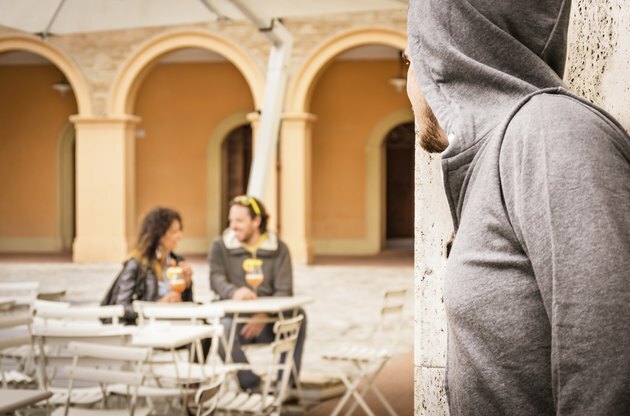 Although being stalked by a partner is very common, it should not be taken lightly. A survey that interviewed over 16,000 people and was published in the National Criminal Justice Reference Service found that 81 percent of women that were stalked by a current or former partner were also physically assaulted by that partner. Its normal to start fantasizing about the future early in the relationship. It can signal a problem when one person wants to rush into the relationship too soon. Red flags to look for include your partner calling you her "soulmate," discussing marriage or suggesting moving in together during the first few weeks of your relationship. If this is going on in your relationship, ask yourself if you truly believe the other person is behaving this way out of love for you. Often, an obsessive person chooses to rush things to have more control over the other person and to have a sense that the other person is somehow trapped and has less opportunity to leave the relationship. If your partner is constantly trying to control you, it can be a warning sign that you might be in a potentially dangerous relationship. Often, a controller will start out slow, always asking questions and wanting to know where you are going. He can use tactics that are so subtle, such as "guilt tripping" you into staying with him rather than going out with your friends, that you won't even notice that you are being controlled. Controlling behavior can easily spiral into emotional abuse when it involves withholding money, belittling or putting down the other person, threats and isolating the other person from friends and family. An extremely persistent partner can also be a warning sign of a dangerous relationship. "Anybody who doesn't hear the word "no" is trying to control you," says security expert and author Gavin de Becker. "Persistence does not mean you are special. Persistence means he is troubled." A relationship in which one person always has to get her way is unfair and unbalanced. You can notice persistence early in the relationship if your partner never lets you choose anything and doesn't seem interested in your wants and needs. This can later become a bigger problem and lead physical or sexual abuse. Everyone experiences jealousy to a certain degree in a relationship. Fearing losing your partner or feeling threatened around other attractive people can be a sign that you care about your relationship. On the other hand, it can become a dangerous problem when jealousy becomes excessive, unwarranted and intrusive to the other person. "Mild or infrequent bouts of jealousy may be perfectly normal, may indicate a bit of temporary insecurity, or may be a helpful cue to attend to our relationship," says Shauna Springer, Ph.D., a licensed psychologist associate. "Pathological jealousy can be quite destructive in a relationship, and, in extreme cases even dangerous in terms of assault behavior, suicide or homicide."